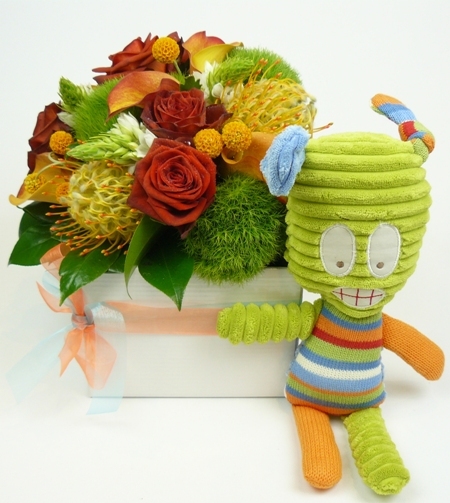 A gorgeous arrangement of bright seasonal flowers in a ceramic cube (perfect for hospital delivery) as well as a cheerful fun toy. The soft toy may differ to picture subject to availability in store. Your Baby Gift Set is wrapped in lush organza and cradled in white tissue inside our signature pickMe carry bag. We then complete your order with a gift card and trimmed with ribbon making the perfect Baby gift delivery! Order by 10.30am for Business Delivery. Order by 1pm for Same Day Home or Hospital Delivery Monday - Friday.